Add Instagram shoppable posts and drive more online sales to your OpenCart store. Select the Instagram hashtag you want to use to display posts and add them to a custom Instagram shoppable feed in your OpenCart site. Customers will be able to view all the photos from Instagram you choose and will be able to add the products they see to their cart straight from the photos. Instagram is a huge sales channel for E-Commerce sites as it enables you to skyrocket your engagement with customers. Create contests, promotions, and Instagram marketing campaigns that encourage your customers to share photos using your products and your hashtag. You can turn posts from customers into Instagram shoppable posts on your OpenCart website with the products displayed directly in the photos customers view in your online store. 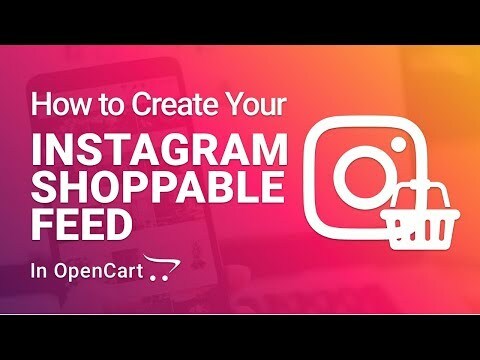 How to create your Instagram shoppable feed in OpenCart? Enter the desired hashtag and create a shoppable gallery in your OpenCart site where customers can buy your products while viewing Instagram posts. Let customers know about the products in the Instagram post they’re viewing. Assign one or more products to each photo. Customers will add them to cart or visit the product page if the item has options. Display your new shoppable Instagram gallery in your homepage or any other layout you choose. Create a custom page for your shoppable Instagram gallery and feature it in your main OpenCart navigation bar. Select the Instagram posts you want to display in your gallery so your customers can only see photos that are handpicked by you. Enter SEO metadata in the custom fields for Meta Title, Meta Description, Meta Keywords and URL alias. By purchasing InstagramShopGallery, you are entitled to 1 Year Premium Support that will get you up and going. You are also granted access to our ticket/feature request system and extension updates. Bundle up. Get InstagramShopGallery and 105+ other OpenCart extensions and themes and save more than $2500. Not sure? Learn more about licensing.